In Europe and the US, middle- and upper-class women followed strict and complicated etiquette guidelines in daily life, including after a family member’s death. Etiquette dictated that a survivor follow at least two phases of mourning—deep followed by half, or second, mourning—to publicly proclaim her grief. Deep mourning, when she was expected to seclude herself from most social gatherings and wear only dull blacks, lasted a few weeks to a year, depending on the mourner’s relationship to deceased, with widows invariably mourning the longest. Women were expected to replace their ordinary goods—dresses, hats, handkerchiefs, stationery, parasols, fans, and so on—with specific mourning ones, always in the latest styles. Daily newspapers, fashion magazines, and etiquette books prescribed ways for women to mourn “well,” fashionably yet still respectfully grief-stricken; to err in doing so was an insult to both society and the deceased. 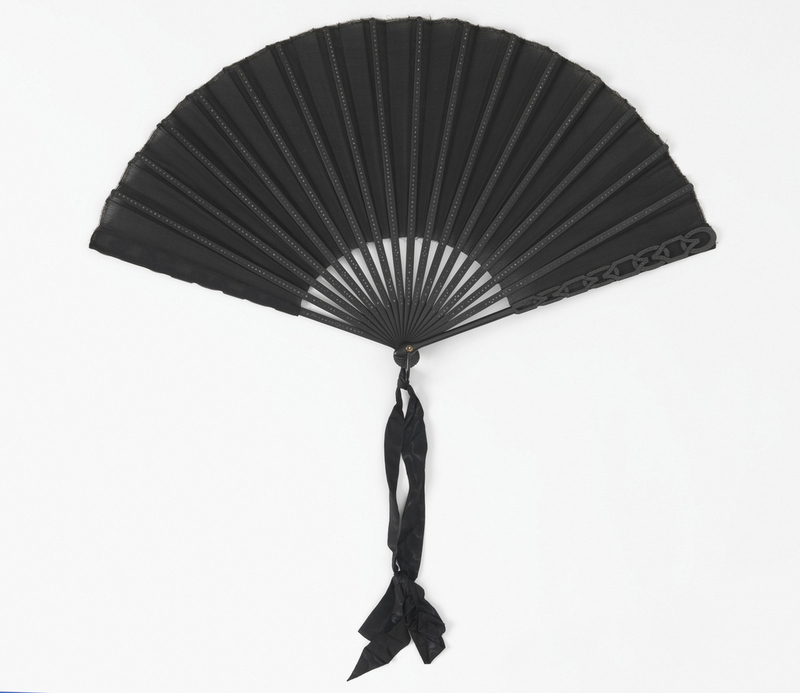 This simple fan of fragile black crepe silk—an unmistakable signifier for mourning—by the prestigious évantailliste Maison Duvelleroy, was likely used in deep mourning, helping the user proclaim her grief, her role in polite society, and her fashionability. Rebecca McNamara is a graduate of the Parsons/Cooper Hewitt Master’s program in the history of decorative arts and design. She is now working in the curatorial department of the Indianapolis Museum of Art under a grant from the Henry Luce Foundation.